Call Christian Speakers 360 at 1.800.966.1380 if you would like to contact a Matt Birk booking agent for a speaking engagement, personal appearance, church function or other faith-based event. Christian Speakers 360 is a Christian talent agency for booking athletes, celebrities, ministers and entertainment. 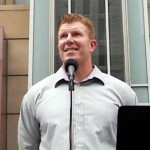 Matt Birk speaks about Christian values. Many of our speakers are born again Christian evangelicals who honor Jesus Christ's message through communities, schools and ministries. For information on Matt Birk's appearance fees, speaking costs and availability, contact Matt Birk's booking agent for details. Matt Birk is a former NFL center. He was drafted by the Minnesota Vikings in the sixth round of the 1998 NFL Draft, and later played for the Baltimore Ravens. established the HIKE Foundation in 2002, which seeks to "impact the lives of at-risk children by providing interactive programs and resources needed to guide a child through the key educational transitions between elementary, middle, high school and college. "The foundation launched "Ready, Set, Read!" in select Baltimore area public schools in the fall of 2010. The program works with about 100,000 Baltimore students on improving their reading skills through an incentive-based system. Birk received the Walter Payton Man of the Year Award in 2011 for his commitment to improving literacy among at-risk youth. Birk is a pro-life activist. His wife volunteers at a crisis pregnancy center and he participated in the Maryland March for Life in 2011. He is also a practicing Catholic and father of six. 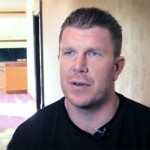 To book Matt Birk for a speaking event or appearance, contact Christian Speakers 360. 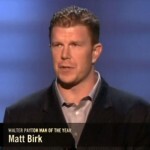 DISCLAIMER: Christian Speakers 360 does not claim to represent itself as the exclusive agent for Matt Birk. Christian Speakers 360 is a booking agency that represents organizations seeking to hire Christian athletes and celebrities such as Matt Birk for speaking engagements, personal appearances, product endorsements and corporate entertainment. Fees on this website are estimates and are intended only as a guideline. Exact fees are determined by a number of factors, including the location of event, the talent’s schedule, requested duties and supply and demand. Christian Speakers 360 makes no guarantees to the accuracy of information found on this website and does not warrant that any information or representations contained on this website will be accurate or free from errors. 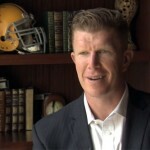 We are often asked how can I find out who is Matt Birk's agent? To find Matt Birk appearance fees and booking agent details, you can contact Matt Birk's agent, representative or manager through Christian Speakers 360 for speaking fee costs and availability. Christian Speakers 360 can help your company choose the ideal Christian speaker or entertainer for your next event. To hire Matt Birk for an appearance, speaking event or endorsement, contact Matt Birk's booking agent or rep for more information.